Basal cell carcinoma has been rated as the most commonly seen type of skin cancer that is treated. Each year, an average of one million people in America gets diagnosed with this disease. Besides being such common, doctors also say that basal cell skin cancer is among the easiest kinds of skin cancer. Basal cell carcinoma may appear at any place on the skin even though it is highly likely to be spotted on areas that are mostly exposed to the sun. This is the most common and frequent type of skin cancers diagnosed today. The cancer mostly affects the neck and head even though other parts of the skin might also be affected as well. In the course of doing your monthly examination on the skin, there are certain signs that you should look at to see if you have basal cell carcinoma or not. Scaly skin: make sure that you look if your skin has a flat sport which is brown or skin toned and one that has a scaly appearance as far as texture is concerned. Open wounds: check if your skin has an open wound that doesn’t heal particularly if the wound is seeping fluid or is bleeding. Bumps: check for any smooth, waxy looking and shiny bump, which is white, pink or red in color. People with a darker skin might have darker bumps. Such bumps are usually crusty and may turn dip down at the middle and could bleed and some tiny blood vessels might be present. White patches on the skin looking like a scar: in most cases, these are usually quite rare and are in fact less noticeable compared to other signs of the disease. 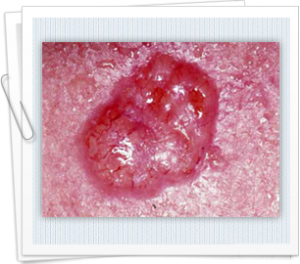 Pink spot: check for a raised patch of the skin, pink in color which could be depressed or crusty at the middle. When the warning signs and risk factors of this kind of cancer are known, the condition can be caught during its early stage. At such a stage, basal cell carcinoma can be treated easily and the likelihood of some serious complications developing is quite low. Basal cell carcinoma might turn out to be very serious when these warning signs are not detected.